My Weekly Indicators post is up at XE.com. The general situation with regard to interest rates continues to deteriorate ever so slightly towards being negative. Now that we have the inflation numbers for April, let's update the wage situation for ordinary Americans. They are also only up +0.2% for the entire last 2 years and 2 months. Increased consumption by ordinary Americans isn't up because they are making more in real terms. Rather, it is because they are working slightly (on average about +0.1) more hours; saving less of their paycheck (down from 3.9% to 3.1% in the last 12 months); and because more people are employed (discussed below). Aggregate wages in this expansion have risen for 102 months so far. At a total of +24.9%, this expansion is behind only the 1960s and 1990s. 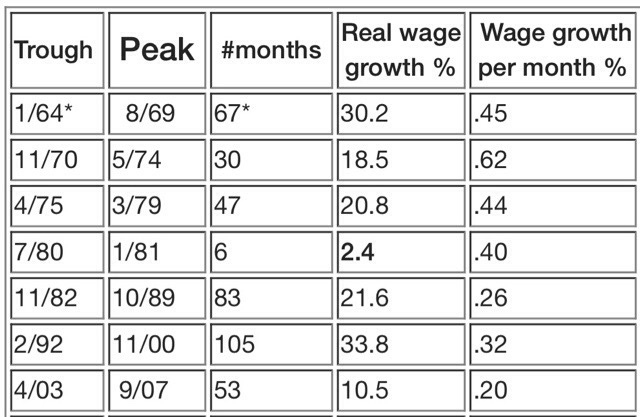 But on average aggregate wages have only grown .24% per month, still in second to last place just ahead of the 2000s expansion and slightly behind the 1980s. The decline in the unemployment rate in the April jobs report has been criticized as being due solely to a decline in the number of people in the labor force. It's worth noting that if that decline had only been about 30,000 less, the unemployment rate still would have declined, albeit only by -0.1% rather than -0.2%. Generally speaking, at the moment the economic condition of the American working and middle class is better than it has been in nearly 20 years. But this is mainly due to the low unemployment rate and paltry rate of layoffs, and the steep decline in gas prices between 2014-16 which resulted in "real" wage growth, rather than any significant wage gains. The Senior Loan Officer Survey for Q1 was reported on Tuesday. Meanwhile, this morning's April CPI allows us to update real M1. Next week we will be 1/3 of the way through Trump's Presidential term. Last year I used to point out that it was really still Obama's economy, as the GOP had failed to pass, nor Trump commence, any economic policy of consequence. In late December the GOP Congress passed and Trump signed their huge giveaway for the wealthy. Yesterday, Trump pulled out of the Iran nuclear deal. Both of these are going to have significant consequences for average Americans. This is about 1.2% higher than just before the Presidential election. On at $300,000 house, that translates to $3600 a year in additional interest. Oil prices have recovered about half of their steep 2014 decline. Nationwide gas prices are averaging about $2.80 a gallon at the moment. Since it takes several weeks for oil prices to feed through into gas prices, prices at the pump are likely to exceed $3 a gallon shortly. That is the sort of thing that consumers notice. 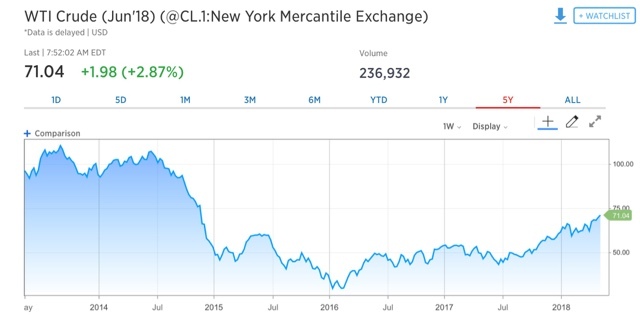 Certainly much of the increase in oil and gas prices is part of the typical commodity cycle, in which "the remedy for low (high) gas prices, is low (high) gas prices." But the recent increase is at least partly a reaction to the likely consequences of further destabilization in the middle east. So, Trump's Presidency is beginning to have real consequences for ordinary Americans. The markets believe that the effects are stagflationary, i.e., leading to both increased inflation and decreased demand. The March JOLTS report this morning is powerful further evidence that raising wages (or training new workers) has become a taboo. Just about everyone thinks that, faced with a worker shortage, "rational" employers will offer higher wages to fill the empty skilled positions. This in turn will draw more marginal potential workers into open unskilled positions. What is really happening -- as so breathtakingly shown this morning -- is that by and large employers will refuse to raise wages, and then complain about their unfilled job openings. As a refresher, unlike the jobs report, which tabulates the net gain or loss of hiring over firing, the JOLTS report breaks the labor market down into openings, hirings, firings, quits, and total separations. Not only has hiring been flat for the last 10 months, but it was higher than today's level in November 2015, January 2016, and January 2017. Meanwhile job openings have skyrocketed by 20% since January 2017, and 25% since the end of 2015! This can only be considered a "skills mismatch" for the wages you want to pay, and if you refuse to train workers without existing matching skills. Incidentally, Paul Krugman may be ready to embrace the idea of a taboo against raising wages, although for now he is plumping for the "employers are afraid of getting stuck with a highly paid workforce when the next recession comes" hypothesis. The problem with that particular hypothesis, though, is that such skittish employers -- a lot of them anyway -- won't bother to post new job openings, since they know they would need to raise wages to fill them. The big spike in openings in this morning's report suggests instead that employers are refusing to get the message. The updated graph shows hiring last making a peak in October 2017. Meanwhile separations actually peaked before then, in July of last year, with a clear downtrend since, another significant revision since last month. *if* both have made their expansion highs, needless to say that would be important. If hiring and total separations have indeed peaked for this cycle, based on the last cycle I would expect quits to continue to improve for a short while -- and they have -- before also beginning to decline. As a counterpoint to that, separations have approached their bottom, a very good sign. Two months from now when the YoY comparisons get much harder, if we haven't established any new highs in hires and total separations, and they are at or below zero -- which is a real possibility -- then we may have confirmation of a late-cycle trend. 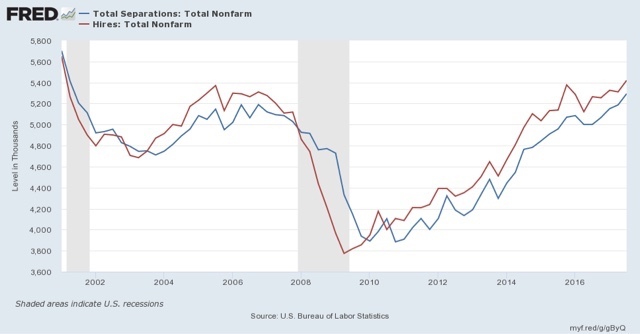 1. a YoY increase in the Fed funds rate equal to the YoY% change in job growth has in the past almost infallibly been correlated with a recession within roughly 12 months. 2. the YoY change in the Fed funds rate (inverted in the graph below) also does a very good job forecasting the *rate* of YoY change in payrolls 12 to 24 months out. One shortfall of that model is that there are two "false negatives" in the low interest rate environment of the 1950s, during which the YoY increases in interest rates by the Fed were relatively modest, and did not exceed the YoY change in payrolls until after the recessions had already begun. A variation on the model is that, since the 1950s, the simple rise in the Fed funds rate from its low near the beginning of an expansion, has always exceed the YoY% change in job growth *before* the onset of all of the subsequent recessions. This variation has limited value as a "yellow flag," strongly cautioning that there is a heightened probability of a recession is within 18 months, with the "red flag" suggesting the near certainty of a recession within 12 months only if/when the YoY increase in interest rates exceeds the (decelerating) YoY% growth in jobs. 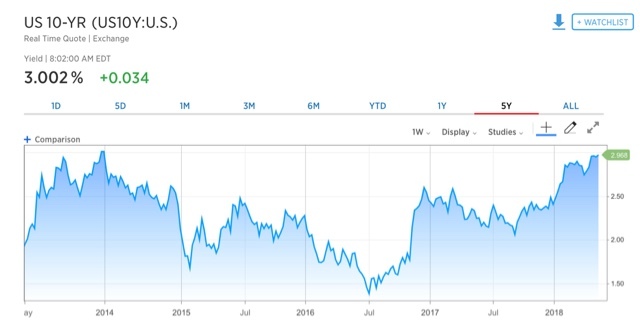 That suggests that if the Fed makes 3 more 0.25% interest rate hikes in the next year, the "red flag" will be triggered at some point in that 12-24 month window. *N.B. This is only one of a number of forecasting metrics I use. The most important is the long/short leading indicator method based on the work of Prof. Geoffrey Moore and Prof. Edward Leamer. This is supplemented by the much more timely but volatile "Weekly Indicators" method. I also have a fundamentals-based forecast based on consumer behavior, and a less-organized corporate model as well.